The health care industry has been keeping up with the latest trends in technology and using them to advance medicine across the country. Along with this trend, medical training programs have implemented new technologies that train individuals more effectively to carry out their heath care roles. 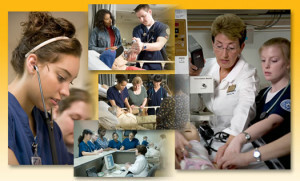 One of the latest advancements is nursing simulation labs. What is a Nursing Simulation Lab? A nursing simulation lab is designed to expose future nurses to simulated patients and hospital settings. Using technological equipment, dummies, and safe simulation equipment, nurses can practice giving care to lifelike artificial patients. They also can practice using their skills and procedures on a lifelike patient to gain a higher skill level before practicing with real patients. Finally, they can experience equipment that simulates the actual machinery used on patients without the associated costs and safety risks that come with real equipment. Should Students Consider Simulation Labs When Applying to Schools? Nursing simulation labs have certainly begun to change the way that potential students view schools. The use of this technology in some schools has led to an increase in applicants, and not without reason. The technology is certainly exciting and revolutionizes the way that nurses learn in their training programs. It is likely that nurse simulation labs will soon become standard practice in nurse training facilities. Since they are currently only present in some clinics, these clinics will be more popular to students. There are a few reasons why students should factor nursing simulation labs into their school decisions. The presence of a nursing simulation lab may indicate that the school is very technologically up-to-date. Likely, the emphasis on new equipment would carry over into the school taking their education very seriously. Some students may also choose these schools simply for the desire to be part of a new movement, or because they are more comfortable or interested in the idea of working with lifelike equipment. Although these schools can be more expensive than other training programs, many students find that the extra expense is worth it. However, these nursing simulation labs are not the be-all end-all of nurse training programs. Many respected programs simply have not updated their facilities yet. These student programs have not lost quality as a result, and they continue to train nurses in the way that they have been successfully training nurses for years. Thus, a student should not fully discount a school just because it doesn’t have a nursing simulation lab. The simulation lab is a great feature that can boost your opinion of a potential school, but be sure to consider the overall picture and choose the school that is best for you in all respects.